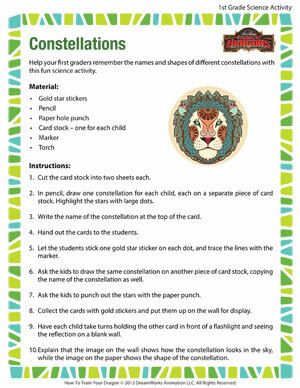 Help your first graders learn more about the different constellations with this fun science activity! With gold star stickers, a paper hole punch and a flashlight, kids do various activities to reinforce the name and shape of their constellation. The kids’ cards are then put up on the wall where everyone can learn about the various constellations in the galaxy.